Yes, you can do this. It's not rocket science. Repotting is fun. 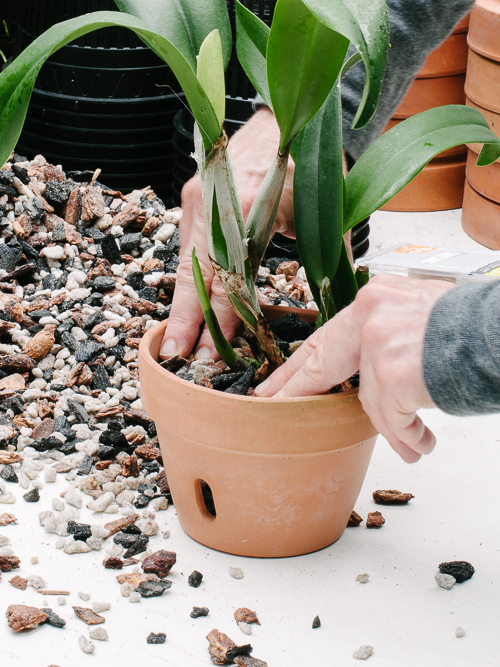 And your orchid will thank you, especially if it's been two or more years since it was repotted. Never repotted an orchid before? We can fix that. Come on into our greenhouse and I'll show you how. 1. Gather your materials. 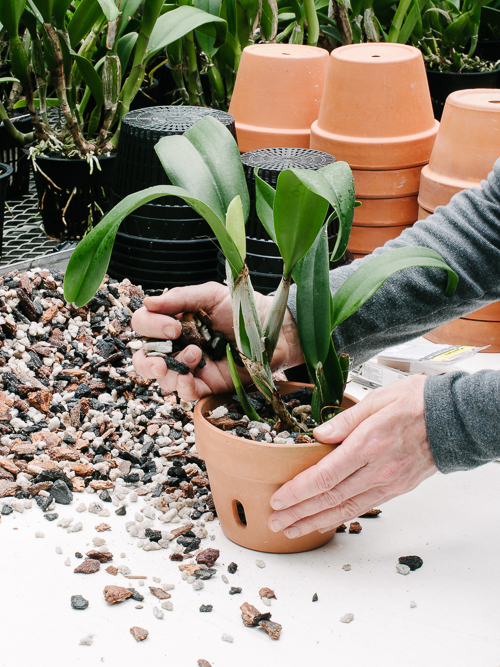 A good basic orchid mix consists of equal parts fir bark, charcoal and sponge rock (aka coarse perlite). You can buy these products online from OFE International and Tropical Plant Products. 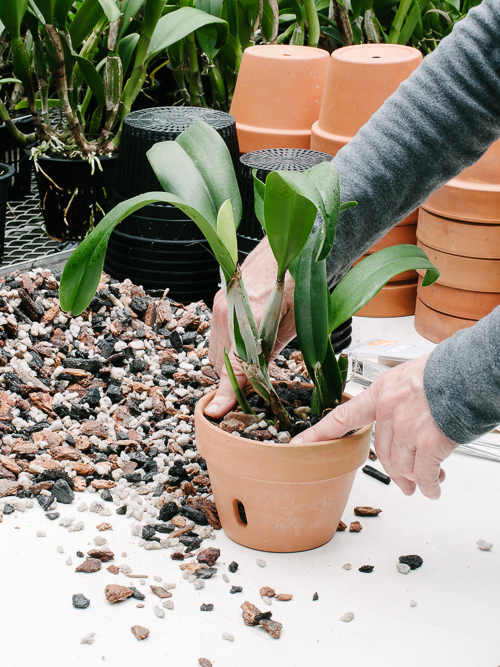 They also sell high quality ready-to-use packaged orchid mixes. 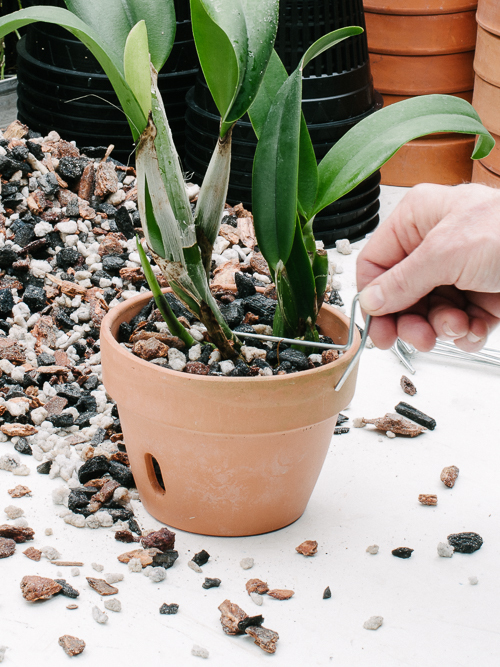 Grower's Tip: The organic component -in this case the bark- can make or break the quality of an orchid mix, because that's the part that breaks down with repeated watering. The bark should be Douglas Fir or Pinus radiata, and should be mold-free. Pinus radiata (sold as Orchiata) and kiln-dried Douglas Fir bark (sold as Rexius bark) last longer than regular Douglas Fir bark. Fir bark often needs to be rinsed beforehand in order to remove dust and sediment. 2. Select a plant. 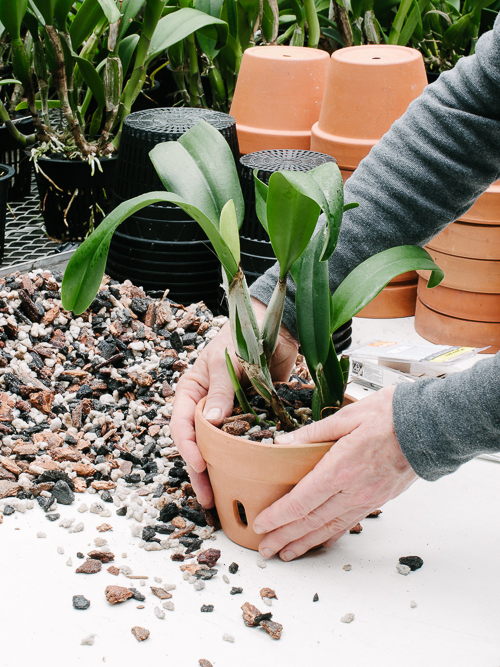 The best time to repot an orchid like Cattleya is when the new shoot is about the length of your pinkie finger. 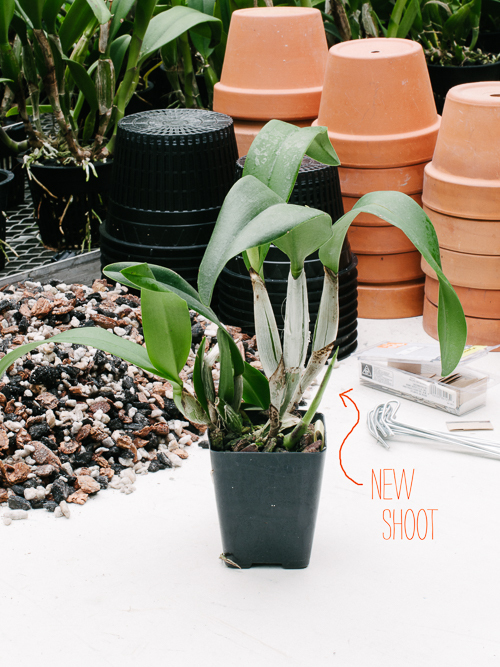 The new shoot indicates that the plant has started a new cycle of growth, the perfect time to provide new roots with fresh medium. We repot every two years, because that's the lifetime of fir bark mixes in our greenhouse. Any longer is asking for trouble -a waterlogged mix that kills roots. 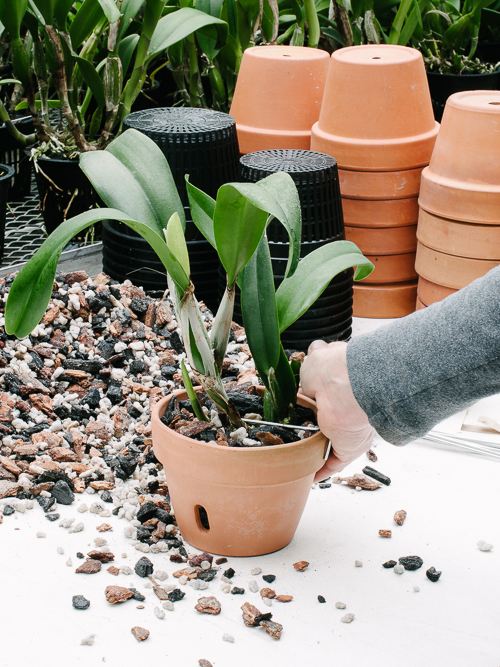 Grower's Tip: Keep your eye on that new shoot while repotting! It is as fragile as new asparagus and if you break it, you lose an entire season's growth, including the flowers. 3. Invert the plant, tap the rim of the pot against the table and remove the plant. Keep the new shoot well away from the table when you do this. Grower's Tip: Water your plant the day before to make it easier to dislodge. 4. Remove the old mix. 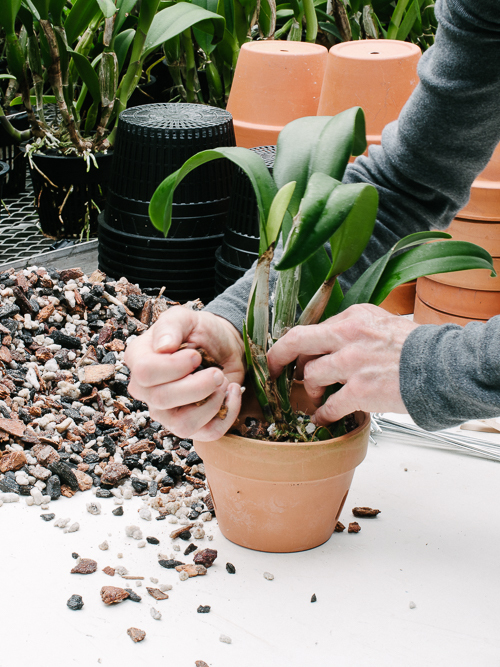 Hold the plant by the pseudobulbs (not the roots!) with one hand and gently prod the mix with your other hand in order to loosen it. Grower's Tip: Expect to find new yellow-tipped roots emerging near the base of the new shoot. Be careful not to break them. 5. Remove the dead roots. Healthy roots are white and firm. Dead roots are grey/black and squishy. You can use pruners for cutting, but remember that viruses in plant sap can be spread by using the same tool on consecutive plants. Grower's Tip: That's why we use one razor blade per plant. We wrap used blades in duct tape before discarding them. When I divide a large plant, I use a kitchen knife and sterilize it with a propane torch between plants. Grower's Tip #2: Notice the new shoot face up on the table? Don't rest the plant on its new shoot. 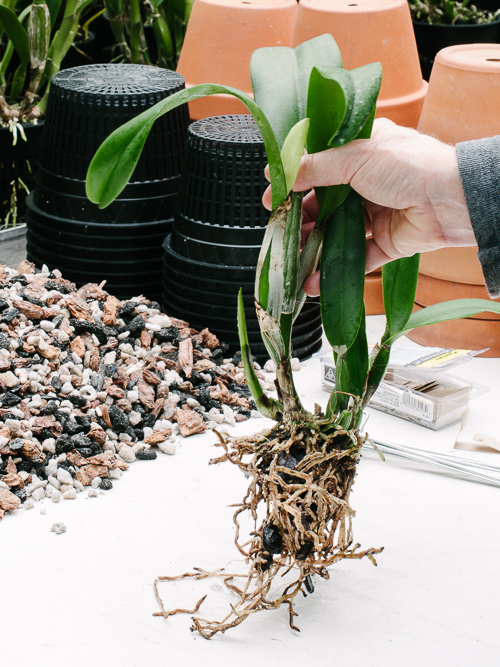 Grower's Tip #3: Orchid roots can absorb tannins from the bark in the mix and appear brown on the surface. A brown root can be healthy. When in doubt, cut a cross section--a healthy root will have a white core. 6. Wash the roots. I like to do this under a gentle stream of water at the sink. It gently removes the old bark hiding in inaccessible places. And it often reveals more dead roots that need to be cut away. 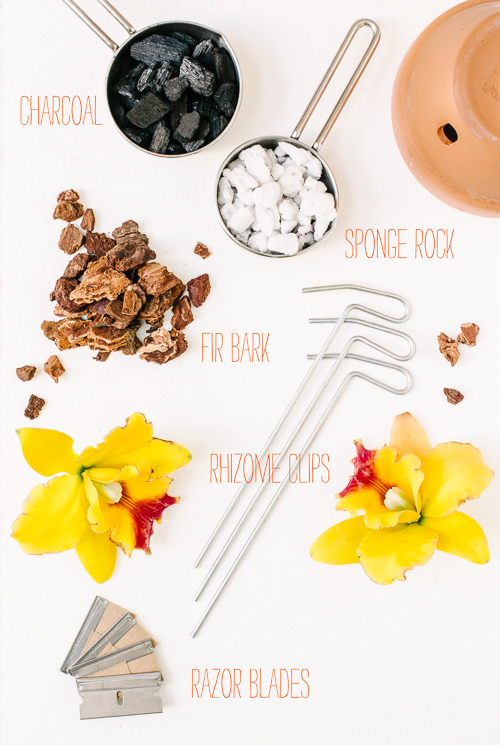 If the roots are healthy you don't need to remove all the mix --only about three quarters. If the roots are in poor shape, remove as much old mix as possible. Grower's Tip: This is a great time to observe how your plant is constructed. 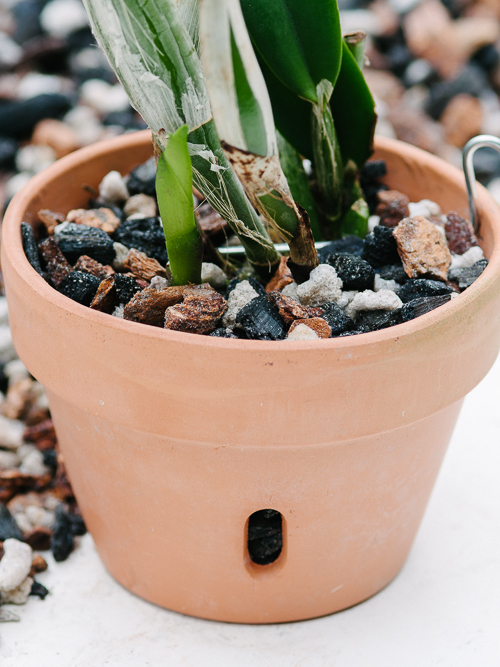 Notice how the vertical shoots (the pseudobulbs) are connected by a horizontal stem (or rhizome, pronounced rye-zome). This will become important in a few minutes. 7. 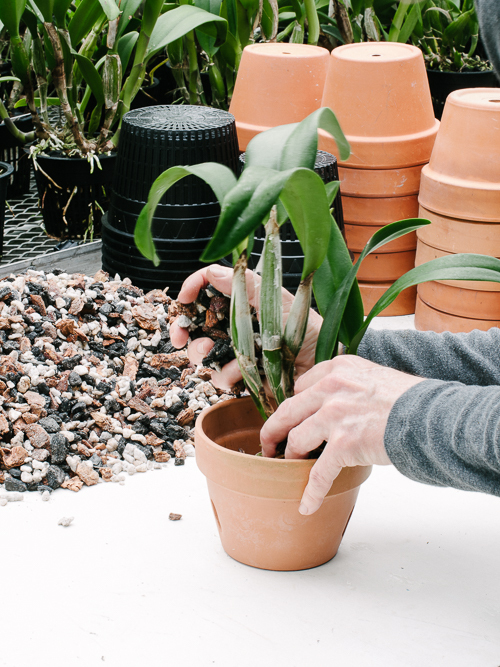 Choose a pot size based on the size of the root mass, not the top growth. One inch bigger all around is plenty. Orchids like to attach their roots to their surroundings. Let them. 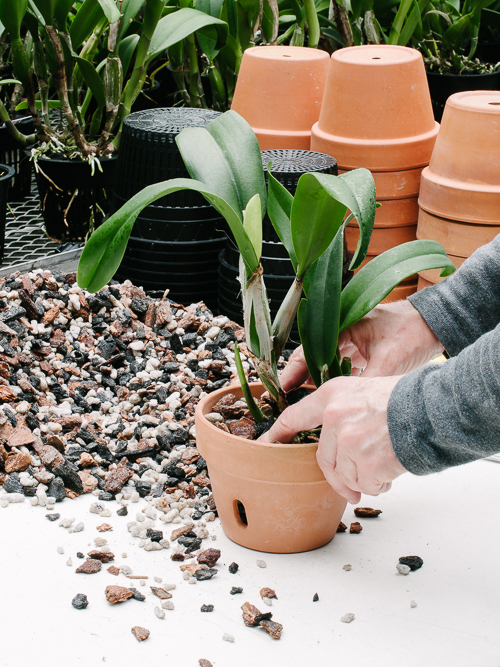 Grower's Tip: A step up in pot size isn't always necessary. Sometimes fresh mix and a clean pot of the same size is all that's needed. 8. Center the new shoot in the pot. See how I'm holding the older part of the plant against the rim of the pot? That's because I want the new shoot in the center where it will have plenty of room to grow over the next two years. Looks asymmetric, right? Absolutely. The new shoot goes in the center. Hold the base of the new shoot about a half inch below the top rim. That's your imaginary fill line. 9. 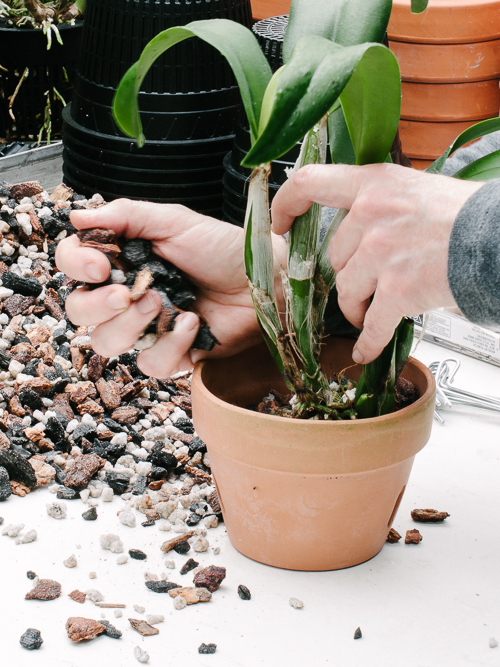 While holding the plant in place with your left hand, add mix with your right hand, small amounts at a time. 10. Firm in using your fingertips. Remember to leave the new shoot uncovered. 11. Alternate adding mix and firming in. The final soil level should be about a half inch below the rim of the pot. 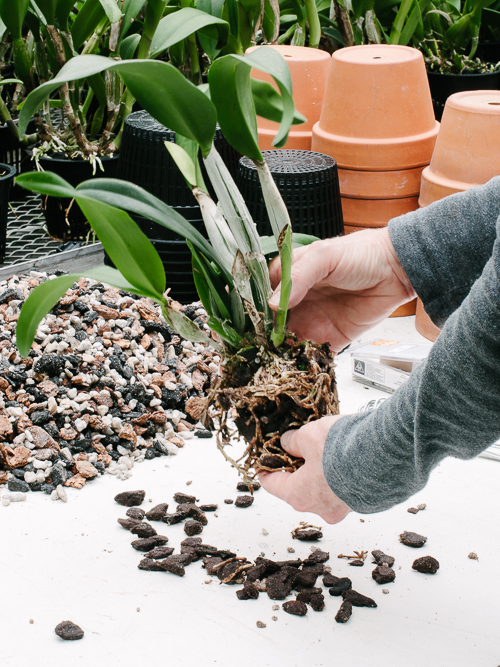 The horizontal rhizome connecting the mature pseudobulbs should be visible just above the soil line. 12. 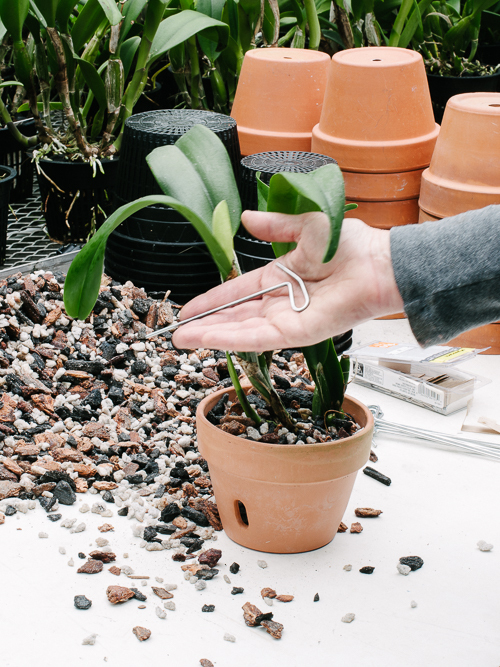 Attach a rhizome clip. 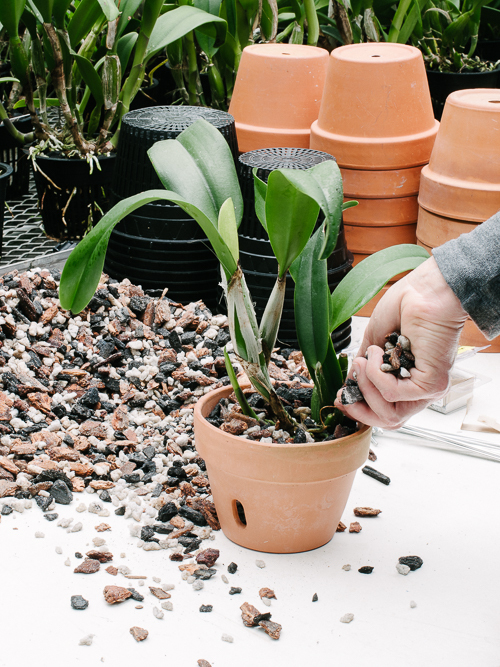 A rhizome clip is an indispensable part of an orchid grower's tool kit. It's what holds the plant upright and steady while its roots are getting established. 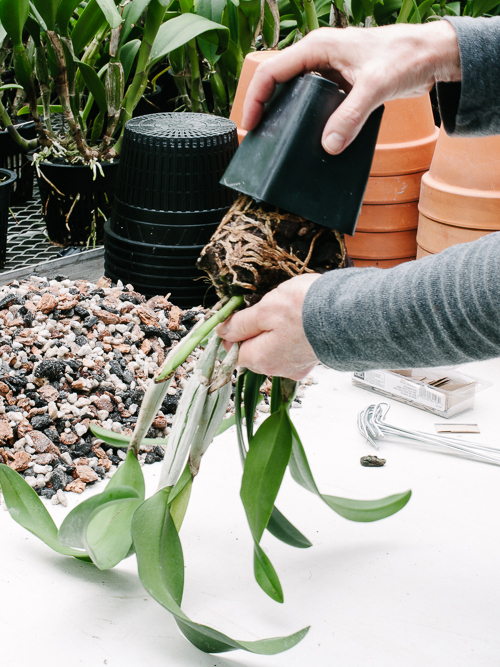 Grower's Tip: There are two types of rhizome clips. The one above is for clay pots. The other type attaches to the rim of a plastic pot. Placement is important. 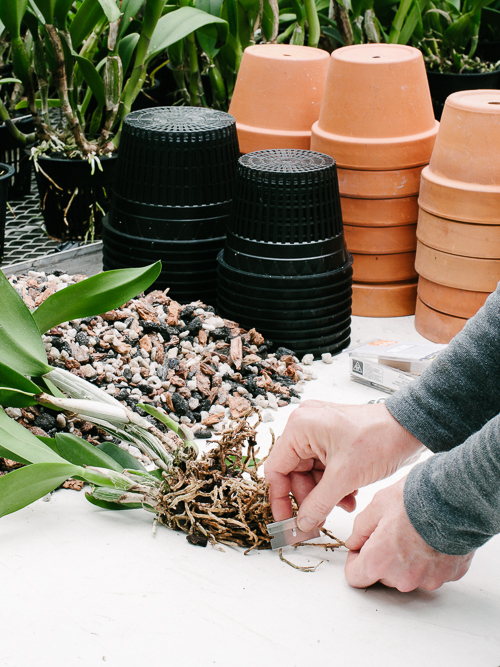 Lay the straight part of the clip across the top of the horizontal stem (rhizome) between two mature pseudobulbs. Avoid placing it directly behind the tender new shoot. It should be perpendicular to the rhizome and resting on top. Hook the hairpin loop over the rim of the pot. And press down firmly with the heel of your hand. Hey, you're done! Congratulations. All that's left now is to water in your plant. Give it a nice deep drink (and no ice cubes, please) and let it drain. 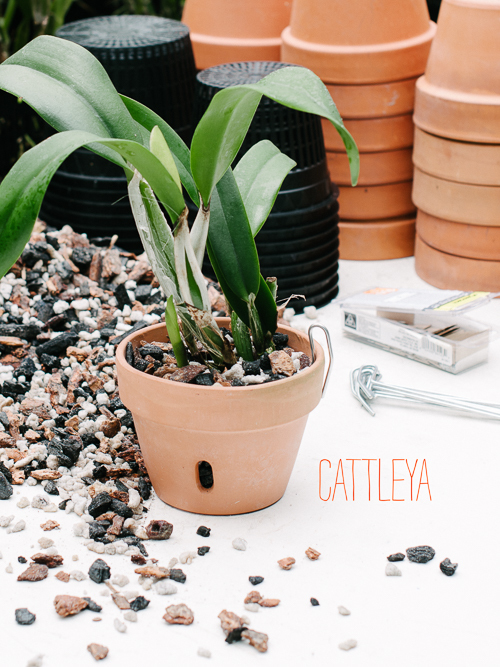 You will probably notice that the new mix dries out faster than the old mix, so it's a good idea to check your plant daily (you do this anyway, right?) to see if it's dry. Give it as much humidity as you can. In a couple of weeks you can resume regular fertilizing. Let me know if you have any questions! Excellent post! An important subtopic is when to divide. 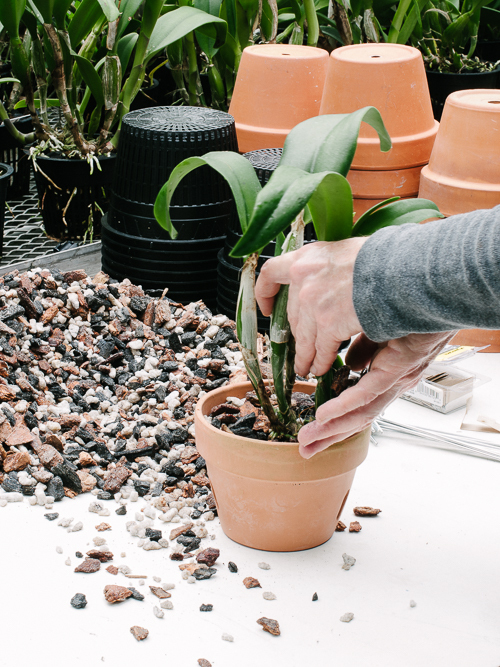 A while back I divided a newly acquired specimen Cattleya hybrid. I attached the divisions to trees around the yard and a couple years later a freeze killed around half of them. If, rather than dividing and conquering, I had kept all my eggs in the wrong basket...I could have lost the entire plant. Basically...the rule is, the more saddened you would be to lose a plant, the more reason to "insure" it by sharing divisions with trusted friends. Orchids are the poster child for bet hedging. One single plant can release millions of seeds each year. I'm pretty sure that's a good part of the reason that they are so successful as a family. Good point. Spreading the risk is always a good idea. Btw, your photos are killer --what a fabulous collection of orchids, ant plants, gesneriads & asclepiads, beautifully grown. Thanks! I love epiphytically trialing a wide variety of plants outdoors year around here in Southern California. My goal is to try and inspire more people to grow plants on their trees. Have you folks tried to grow any plants epiphytically outdoors year around? If you ever plan on visiting the Huntington Botanical Garden... you're welcome to visit me as well. I'm only a few minutes away so you could attach two epiphytes to the same branch (aka kill two birds with one stone). Your epiphyte trees are magnificent. What kind of tree do you use? The bark looks very distinctive and no doubt appealing to orchid roots. Unfortunately, it's too cold and wet here for outdoor epiphytes with night temps in the twenties in winter. Thank you for the invitation! I've been told that it's a Deodar Cedar. For a while now I've been interested in finding the best phorophyte. I have orchids growing on more than a couple dozen different phorophytes...even on a tall Echeveria. None of them are noticeably better than the rest. Let me know if you ever find a phorophyte that's particularly good. Have you tried Pleopeltis polypodioides, Tillandsia usneoides or Epidendrum conopseum outside? Those are probably the best North American candidates. South America and Asia have far more candidates...given that they both have a large/long relatively uninterrupted corridor from the tropics. What a privilege to be able to grow your Orchids on trees (naturally)! I found it to be quite satisfying just putting them outside for the summer, but leaving them outside all year is not an option here in the Midwest. It does however seem like the way to go when you can. I also agree that dividing important plants provides you a bit of insurance. Then again though there's the trade off of now having smaller plants. This summer I had an Degarmoarara come down with what seemed like Brown rot. I separated the two affected (younger) pbulbs from two older ones and now it seems time to toss the younger two but the older ones may survive as they don't appear to have been affected by the rot. Obviously this division probably saved my plant. Good luck with your trees! 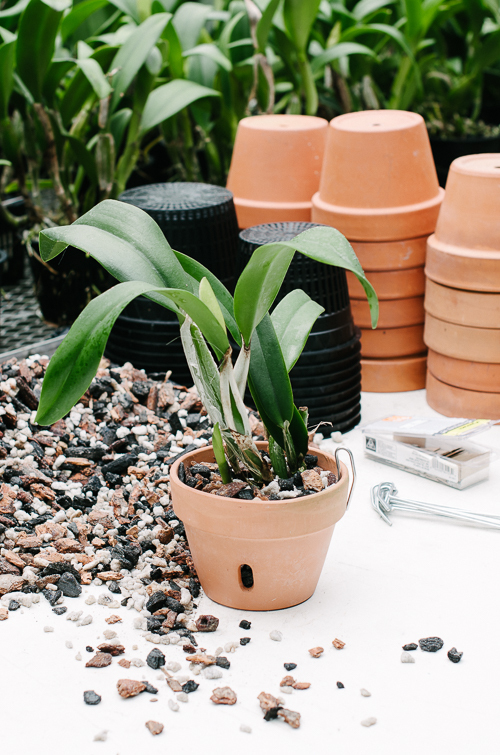 Maybe you could try growing orchids on potted plants/trees? For lack of a better term I'm referring to this as "phorobana". That links you to my blog entries on the topic. If I lived somewhere too cold to grow epiphytic orchids outdoors year around my house would be filled with phorobanas. Great post. I officially started collecting and growing Orchids this year. 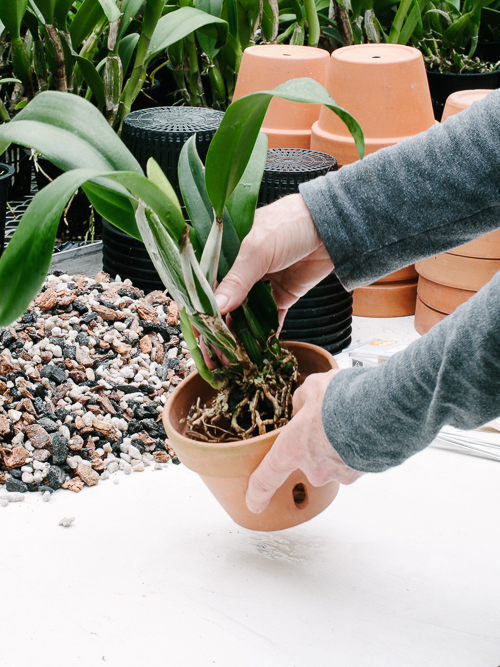 The matter of repotting them was certainly a little nerve wracking, especially when you have different species (Paph roots versus Phals for instance). I appreciate your bit about a healthy root cross section as learning a healthy root from one that should be cut is important. I also appreciate your advice on high the medium should be. Thanks for your comment, eLPy. Good point about repotting different species. 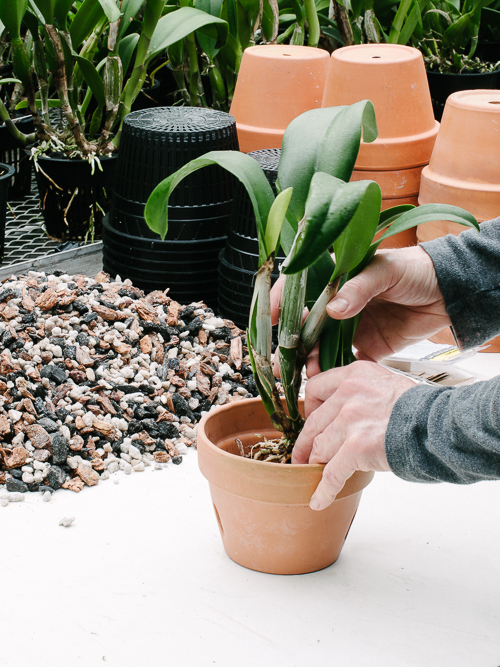 Repotting orchids is never an assembly line process in the way that repotting annual plants is.